Dominant Life Form: Anthropomorphic humanoids, "human beans"
History: (What If? I#8/2) - Mild-mannered spider Webster Weaver excelled at science at Aboutknee High and was often bullied by a fellow student named Trash. After being thrown out of the Daily Beagle by J. Jonah Jackass, Webster decided to immerse himself in science, visiting a lecture being given in Hugeville. Unfortunately, the radioactive shielding failed during the lecture, irradiating the scientist lecturer, who ran into the tiny Webster, accidentally knocking Webster into his mouth where he bit down. Returning home, Webster was nearly run over by a car, causing Webster to instinctively leap onto a wall. He soon realized that he had been endowed with the power of a "human bean." Deciding to use his powers responsibly, Webster created the costumed identity of the Man-Spider. Noticing that all of his natural spider abilities had been amplified, Man-Spider soon became a television sensation on WEBB. One day as Man-Spider was leaving the studio, a crook ran past him and the police officer yelled for Man-Spider to stop him but "Manny" just let the crook pass, claiming that it was the police officer's job to stop crooks. The officer then explained that the crook had just robbed and killed Webster's uncle Bug, teaching Man-Spider a lesson about responsibility. Man-Spider then vowed to never again shirk his duties and he soon became an accomplished superhero, battling such foes as the Culture Vulture, the Rude Rhino, the Green Gobbler, Marvin the Hunter, "Octo" Doctorpuss the Cat o' Nine Tails, the Leapin' Lizard, King-Pig, and the Bog Dog. It wasn't long before Barbara Walrus reported on a villain demanding $1, 000, 000, 000 within 24 hours or he would destroy the atmosphere. Tracking the villain down, Man-Spider discovered that it was Raze the Bug-Spray Baron. Realizing that the Baron was the one who had killed his uncle Bug, Man-Spider escaped the Baron's bomb only to watch it destroy the Baron himself. Man-Spider then took his leave, claiming that he now had the most horrible menace of all: his aunt Mayfly's Chicken-Pox Soup. Comments: Created by Scott Shaw. This reality was an alternate reality, as many of Earth-616's characters were humanoid animals. Bog Dog was a villain that Man-Spider fought early in his career as a hero. 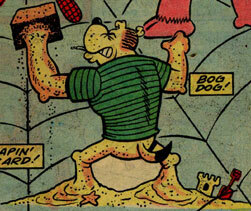 Bog Dog was composed of and could manipulate sand, like his Earth-616 counterpart: Sandman. Trash Chompson was a local bully at Aboutknee High who picked on Webster Weaver, despite pleas from fellow student Liz. Trash's Earth-616 counterpart was Flash Thompson. 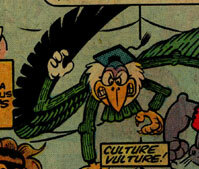 Culture Vulture was one of the earliest villains that the Man-Spider fought. Culture Vulture had wings capable of flight, similar to the artificial wings owned by his Earth-616 counterpart: the Vulture. 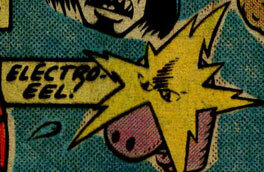 Electro-Eel was one of the many recurring villains of the Man-Spider. He presumably could project electricity, like his Earth-616 counterpart: Electro. 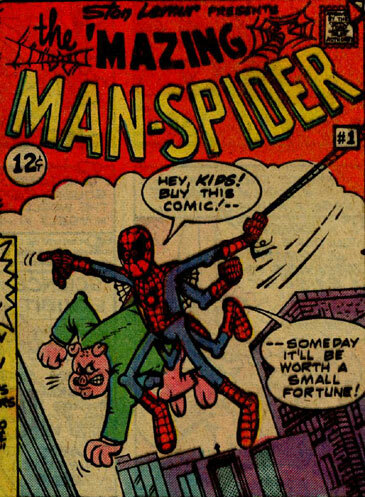 Fish-Terio was yet another villain in the Man-Spider's rogues gallery. 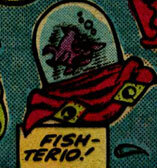 It was unknown if Fish-Terio used any illusion-based gimmicks, like his Earth-616 counterpart: Mysterio. The Green Gobbler was one of the many foes that Man-Spider fought following the death of his Uncle Bug. 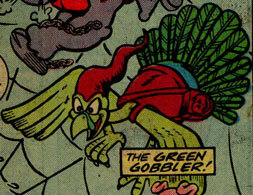 The Green Gobbler had wings, unlike his Earth-616 counterpart: The Green Goblin. Miss Grunt was the secretary to Webster Weaver's boss, J. Jonah Jackass. When Webster tried to sell Jonah photos, Jonah had Miss Grunt throw him out. Miss Grunt's Earth-616 counterpart was Betty Brant. 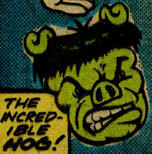 The Incredible Hog was one of the many villains faced by Man-Spider. He presumably had superhuman strength that increased at his got angry and superhuman durability, like his Earth-616 counterpart: the Incredible Hulk. Scott Shaw later reused the "Incredible Hog" gag for DC's Captain Carrot and his Amazing Zoo Crew. J. Jonah Jackass was the head of the Daily Beagle newspaper in which Webster Weaver often tried to sell photos. J. Jonah Jackass was gruff, just like his 616 counterpart: J. Jonah Jameson. 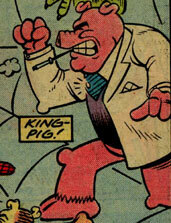 Following the death of Man-Spider's Uncle Bug, King-Pig was one of the many villains he faced. He was big and strong, like his 616 counterpart: Kingpin. 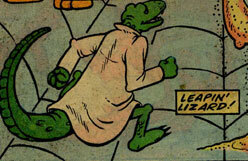 Leapin' Lizard was another of the villains Man-Spider faced in the time following his Uncle Bug's death. Leapin' Lizard resembled a giant lizard, just like 616 counterpart: the Lizard. Liz was a student at Aboutknee High and constantly tried to get Trash Chompson to stop bullying Webster Weaver. Her 616 counterpart was Liz Allen. Webster Weaver was a mild-mannered student at Aboutknee High who was often picked on. One day, after being thrown out of the Daily Beagle, Webster visited a science exhibit by humans in Hugeville. While there, the scientist presenting the exhibit on radiation was irradiated and as he tried to run away, he ran right into the hanging Webster, biting his arm. After narrowly avoiding a car on his way home, Webster found that he had been given the powers of a "human bean." Deciding to use his powers as a media celebrity, Webster allowed a criminal to escape a police officer's chase, feeling that it wasn't his job to catch thieves. The officer quickly explained that the crook had just murdered Bug Weaver, Webster's uncle. Learning a harsh lesson, Webster became a superhero called the Man-Spider, fighting numerous exotic villains until coming face-to-face with his uncle's killer, Raze the Bug-Spray Baron. Raze easily captured the novice hero before tossing a bomb into the bug-spray filled room holding Man-Spider captive. The bomb ignited the spray, causing an explosion that cost Raze his life, with Man-Spider narrowly escaping. He then returned home, dreading having to now face his worst enemy ever: his aunt Mayfly's Chicken-Pox Soup. As a spider, Webster Weaver had eight appendages, could generate webbing, and adhere to solid surfaces. He could sense when danger was nearby. 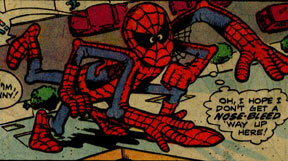 After being bitten by a "human bean," Webster gained super-spider strength and agility, like his 616 counterpart: Spider-Man. 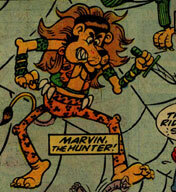 Marvin the Hunter was one of the earliest foes that Man-Spider fought. He presumably had enhanced physical attributes, like his 616 counterpart: Kraven the Hunter. 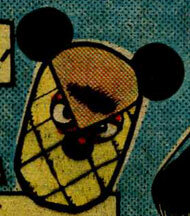 Mister Potato-Haid was one of the many exotic villains that battled Man-Spider early in his career as a superhero. Mister Potato-Head was a master of disguise, like his 616 counterpart: Chameleon. "Octo" Doctorpuss was one of the early villains fought by Man-Spider after his Uncle Bug's death. "Octo" Doctorpuss had nine metallic tails, similar to the metallic tentacles owned by his 616 counterpart: Doctor Octopus. 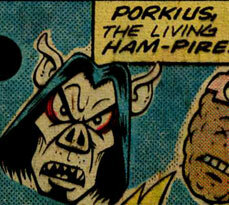 Porkius was one of the more exotic villains in Man-Spider's rogues gallery. He presumably had same vampiric powers of his 616 counterpart: Morbius the Living Vampire. Raze the Bug-Spray Baron was a crook who, after killing Bug Weaver, tried to escape the police. While escaping, he ran past Man-Spider, who let the crook get away. After discovering that the crook had murdered his uncle, Man-Spider became a superhero, fighting many exotic villains before confronting Raze himself. 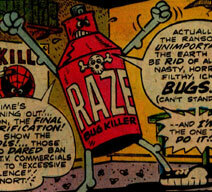 Soon learning that Raze was the same crook he had let get away, Man-Spider escaped Raze's headquarters just as Raze threw a bomb into the bug-spray filled room, causing an explosion that cost Raze his life. Raze could emit bug-spray from the top of his costume, if it was indeed a costume. He also carried bombs in case the need arose. The Rude Rhino was another early villain in Man-Spider's heroic career. He presumably had the same enhanced physical attributes that his 616 counterpart, Rhino, had. The Schlocker was another foe of Man-Spider. It was unknown if he possessed the vibration-generating gauntlets of his 616 counterpart: the Shocker. 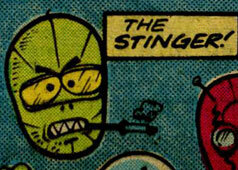 Stinger was yet another foe in Man-Spider's rogues gallery. He apparently was an avid smoker. It was unrevealed if the Stinger had enhanced physical attributes and a scorpion-like costume, like the one worn by his 616 counterpart: the Scorpion. 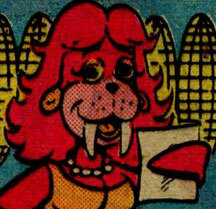 Barbara Walrus was a known television personality who announced Raze's demands to the world when Raze tried to destroy the atmosphere. Barbara Walrus was this reality's version of the real-life television personality, Barbara Walters. Bug Weaver was Webster Weaver's well-meaning uncle who was killed by Raze the Bug-Spray Baron. His 616 counterpart was Ben Parker. Mayfly Weaver was Webster's well-meaning aunt who often served Webster her infamous Chicken-Pox Soup, much to Webster's dismay. Her 616 counterpart was May Parker. 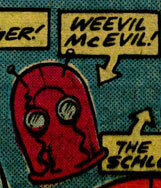 Weevil McEvil was another of Man-Spider's villains. He wore a suit of armor, like his 616 counterpart: the Beetle.